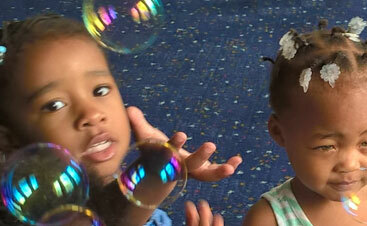 Darlene’s Wee Care 4 Kids day care center knows that some toddlers and preschoolers just have more energy than others. In fact, it might seem that some have the energy of several toddlers in a single body. We know it can be a challenge to manage this energy level at home. We have some ideas to help you while also helping your child develop their fine or gross motor skills. If you have a child that seems to think that the most fun she or he can have with any toy is to see how far they can throw it, we have a few suggestions for you. First, find out if there is a Major League Baseball farm team near you to sign them up! Then, get two laundry baskets and place them at opposite ends of the room. Fill up one basket with balled up socks. Show them how you can throw a balled up sick from one end of the room and get it in the other basket. Let them throw and aim the socks. Many children love this game and will like to fill up the basket and then turn around and throw the socks in the other direction. In addition to getting their energy out, it may buy you enough time to move the laundry on, or do the dishes, or even go the bathroom by yourself! We know it can be a challenge to keep up with a toddler who has tons of energy. You have to keep up with them, or even one step ahead to make sure they are safe. Call us today to tour our facility.